Make appointment booking and scheduling easy with our time slot booking system! 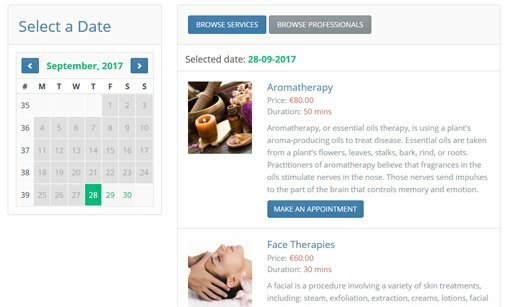 Time Slots Booking Calendar is an appointment calendar and online booking system that allows clients to book appointments with you. The time slot calendar is suitable for both individual and group appointments. 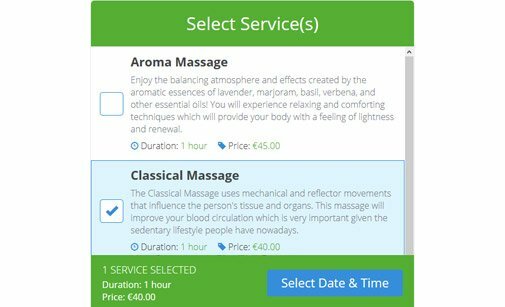 That makes it the perfect reservation system for booking appointments with hairdressers, therapists, private trainers, as well as arranging a spot in group classes. Setup and script integration are totally painless! Configure time slot length. You can add both regular and custom time slot length for any calendar date. 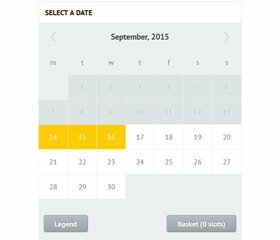 There are two front-end layouts for Time Slots Booking Calendar. Switch between them using a simple drop-down menu. The time slot calendar supports online payments via PayPal, Authorize.Net, as well as CC payments and wire transfers. 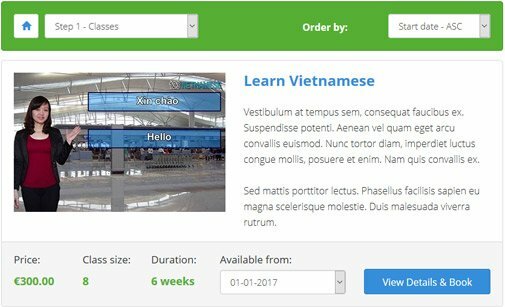 Edit the default language used in the booking calendar script using a simple language editor. with slot lengths, lunch break and days off. Set default Email & SMS alerts and configure the back-end system to send them out both to admins and clients. system for reserving group appointments. Below is a preview of the Time Slots Booking Calendar. You can see both the front and the back-end system and test all features. Preview some of the layouts offered for our calendar with time slots. Click the button below to open the admin panel of time slots booking system. 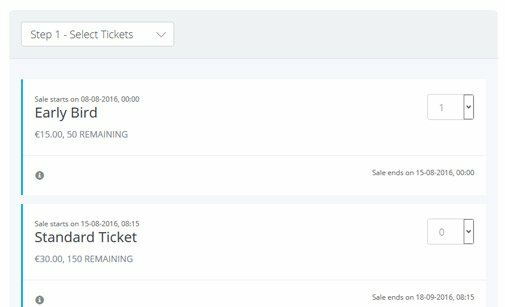 You can buy the Time Slots Booking Calendar either with a Developer, or with a User License. Let our clients share their experience with our appointment booking calendar and how the script has improved their online business. Having wasted 3 days on finding a workable open source calendar booking script I finally decided to buy your excellent Time Slots Booking Calendar in order to run a tennis court booking system. The script was 90% perfect for the job but required some key modifications such as repeat and block booking and deletion. The service provided by PHPJabbers was incredibly fast, efficient and inexpensive. Thank you to Alexander 'Sasho' Valkanov for a superb job. 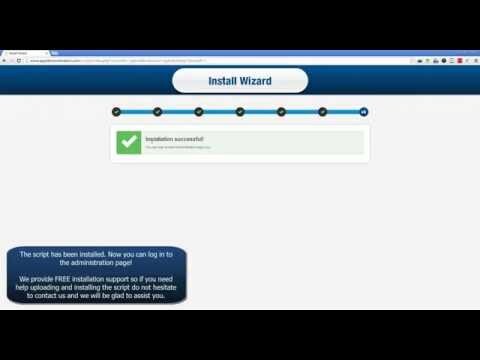 I am happy to thoroughly recommend your PHP booking scripts and service to everyone. Fantastic service, really impressed. I am really happy to have found PHPJabbers.com. This is the first time I outsourced work and so I was quite nervous about doing it. But StivaSoft team did a great job. They were able to make all the modifications I requested on quite a difficult booking system job. Veselin Stoilov is very patient and Kosta Todorov is very smart. I couldn't ask for a better team. PHPjabbers has the most in-depth calendar software solution I've found on the web. 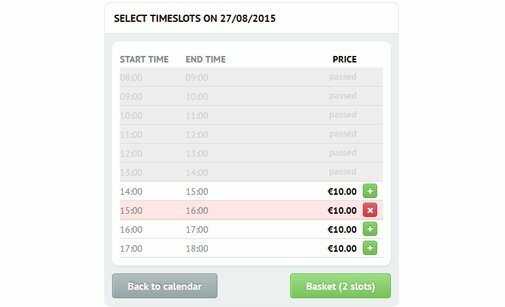 The time slot booking system functions are great and offers everything we need and more. More importantly, the support we have received has been the best ever!!! They are fast, reliable and affordable. Thank you so much for making this booking calendar script such a wonderful solution for us! I can HIGHLY recommend PHPjabbers.com and the Time Slots Booking Calendar. 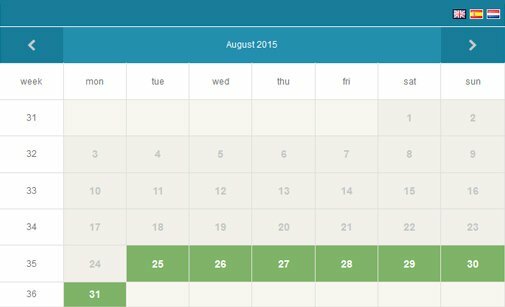 The appointment booking calendar is scalable, customizable, versatile and user friendly. More importantly the support staff is amazing! We've been developing web sites for over 10 years and StivaSoft has the best support team we have ever encountered! 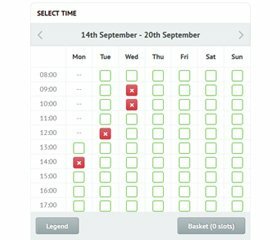 You can have a booking calendar up and running in no time... and the staff will help with any question you may have. 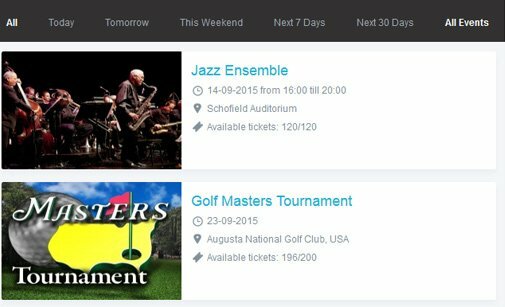 When I looked at the Time Slots Booking Calendar on PHPJabbers.com, I saw the foundation for a fantastic online tee time application for our golf course. The PHPJabbers team provided a very professional, and reasonably-priced, customization that met every expectation I had. These are simply OUTSTANDING people to work with! The online scheduling feature has made making multi-party appointments incredibly simple and efficient. Since this negates the need to make multiple calls to our mediators, their time spent on calls regarding logistics is minimal and more time can be spent on their services and expertise. Thanks for a great solution! These PHP Jabbers guys are superb. They are quick to respond, extremely helpful and provide a first class cost effective customization service. Thanks for all your help lads - I look forward to working with you again. I purchased the time slot booking system form PHPJabbers and it's perfect for the task I need. It does exactly what it says on the tin and more. Support - what can I say - exceptional. You've got some great products - your time slots calendar is EXACTLY what I've been looking for. I run an IT company here in Southern California, and I look forward to doing much more business with your company in the future. Thank you for the lightning-quick response - it was a welcomed surprise. I needed an online booking system that would take reservations for my recording studio. After investigating just about every calendar booking script on the net, I eventually chose PHPJabbers's Time Slots Booking Calendar as being the most user-friendly and attractive calendar that I'd seen. The basics were already in place but I needed several modifications to meet the needs of my business. It took quite some time and a lot of correspondence before it was all working as required. The staff here were incredibly patient with me and were very prompt in responding to my needs and queries. What's more the price was really good value. I have no hesitation in recommending this company to anyone who needs a calendar script customized to their needs. I've done lots of research before purchasing this Time Slot Booking Calendar. Now I'm very happy with my decision. I need many things to be modified in the booking system to suit my cleaning business. These guy did quickly and professionally. Even after months of purchase, they response very fast and positively to any tickets I submitted. 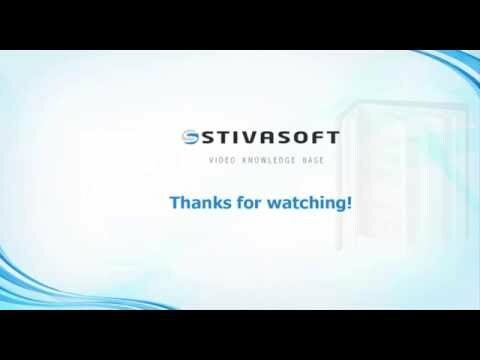 You will not feel alone after the purchase, StivaSoft back up team is there! I have to say that, the service is even better than the local computing company I used before really. Thanks again for all your help. Thank you for providing professional quality PHP scripts. I am using the Time Slots Booking Calendar. The whole process, from purchase to support questions, is user friendly and just plain works. I had an issue that prevented the script from working completely. Support was always quick to answer and found that I had conflicting email addresses in my PayPal account. My rating for StivaSoft is A+++ and I would recommend their products to my colleagues and friends. Read more about our Support Service and how we can help you install Time Slots Booking Calendar. Find how-to tips which will help you get the most of Time Slots Booking Calendar.